Join in with the animal’s excitement as they get ready for the arrival of Baby Jesus. This classic children’s story features simple language, die-cut board pages, and friendly illustrations creating a wonderful reading experience for toddlers. 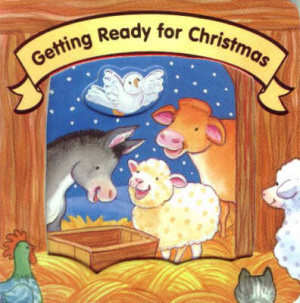 The animals are excited about Jesus' birth, and your children will be, too, as they turn each colourful page and watch the animals get ready for the baby. Suitable for up to 4s. Getting Ready for Christmas by Jesslyn DeBoer was published by Lion Hudson in September 2002 and is our 13025th best seller. The ISBN for Getting Ready for Christmas is 9781859854518. Somewhat twee: the animals prepare the manger and 'Baby Jesus is so sweet'. No mention that he happens to be the Son of God. Bought some last year as well. Always buy a little book as a Christmas gift for members of our Toddlers Group at church, and this series is ideal. Simple text - tough board book - tells the basics of the REAL story of Christmas to little ones who might have no other Christian connections. A good product for thge very young. This was a very good buy for one of my young granddaughters. Got a question? No problem! Just click here to ask us about Getting Ready for Christmas.